Where does inquiry come from? This week I came outside and was immediately drawn to what “N” was doing. I could hear him before I could see him. He had discovered that if he took a chunk of ice and hit it hard against the metal pole, that not only would it make a sound but that the sound would sustain for several seconds afterwards. He has a quizzical look on his face as he tried it again and again. I’m translating our conversation from French so I apologize for any awkwardness in the phrasing. ECE: It continues (the sound) for a long time. “N” and friends “I” and “B”: bing, bing, bing, bing. ECE: It’s like church bells. Me: How long will it last, “N”, if you hit it and leave it alone? Can you count? “I” leans against the pole and “N” hits it again. Me: Oh, but is it different when “I” doesn’t lean against the pole? 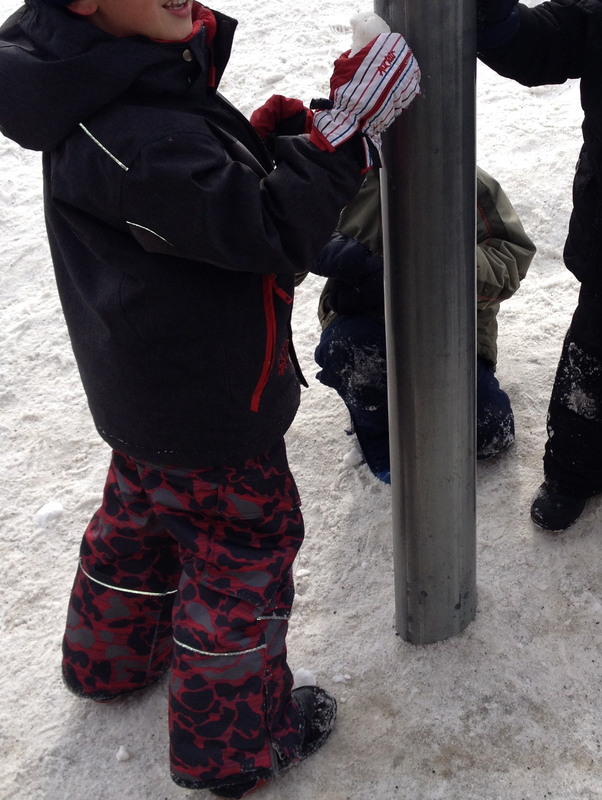 We went through a few trials of “N” hitting the pole and “I” touching it before we got one when the sound dispersed on its own. I wondered if “I” was interested in the feeling of the vibration. Me: 1 – 2 – 3…. Me: Do you think the sound will be shorter when “B” is touching it? Why would the sound be shorter when someone touches the pole? “N”: Because it’s not hard. Me: Because it’s not hard if someone is touching it? If someone touches the pole and the sound it shorter – why is that? “N”: (with that quizzical look) Because the ice is harder. Me: The ice is harder? 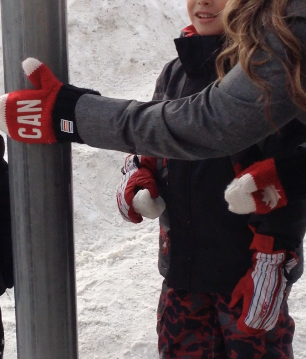 ECE: Look “I” – touch the pole, put your hand here. “N” (speaking to “I” and taking his hand to place it on the pole): You do like this (hand on the pole), I do like this (hitting the pole). Me: Does the sound last longer when no one is touching it? “N”: 1 – 2… two. Me: Just two when someone’s touching? And why is that? Why doesn’t the sound last as long when someone’s touching it? 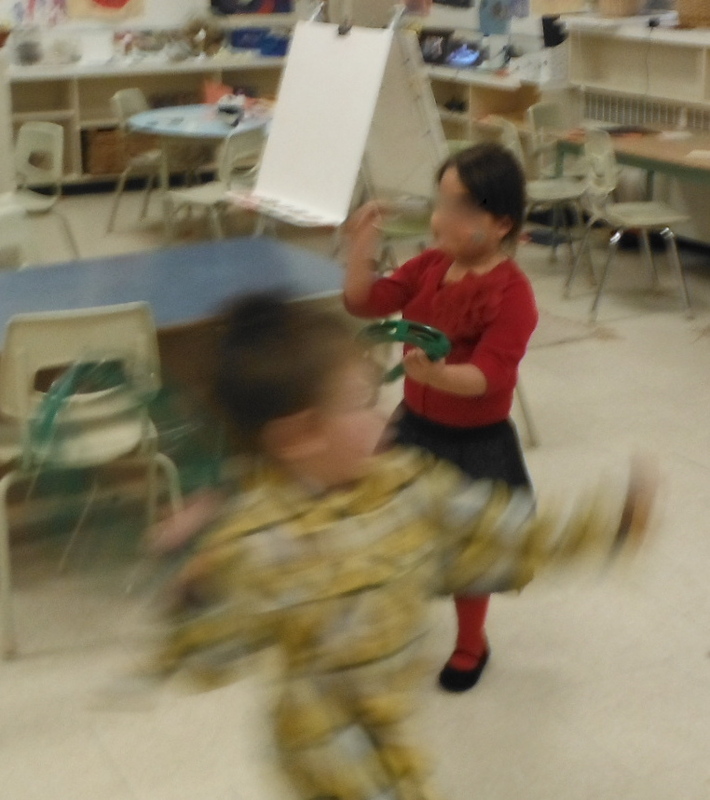 ECE (placing her hand on the pole and moving in closer to “N”): What happens to the sound when “I” touches the pole? Why doesn’t it last as long? “N”: The hands stop the sound from moving. Me: The hands stop the sound from moving… wow. This was an amazing moment. We knew that “N” could get there, that if he had enough time to puzzle it out he could come up with a hypothesis that fit with his observations, both auditory and tactile. His initial hypotheses that the ice and the pole became harder didn’t seem to satisfy him any more than they satisfied us. We’ve had many opportunities for sound-making outside with found-sound instruments attached to our fence (pots, pans, metal and wood pieces, etc…) but this is the first time I’ve observed that experimentation leading to meaty inquiry questions. Where will we go with this? We’re going to show this video to the whole class this week and present them with more opportunities to play with sounds and vibrations. While we usually teach our own music in the classroom with singing and small rhythm instruments, I think that this new thread will prompt us to visit the music room so that the students can experience bigger and more vibratory instruments. I can’t wait! Bring on the noise! “Some people think that Ebeneezer Scrooge is. It’s spring in the North Country. Actually, that’s not really true. It might be Spring soon but for now we’ll make due with a bit of warmth from a slightly closer sun as we walk down the street, still having our cheeks stung by a fierce winter wind. The tiny rivulets of water sneaking under the snowbanks give us some reason to hope. Spring brings Easter, just as winter brought Christmas and autumn brought Halloween. 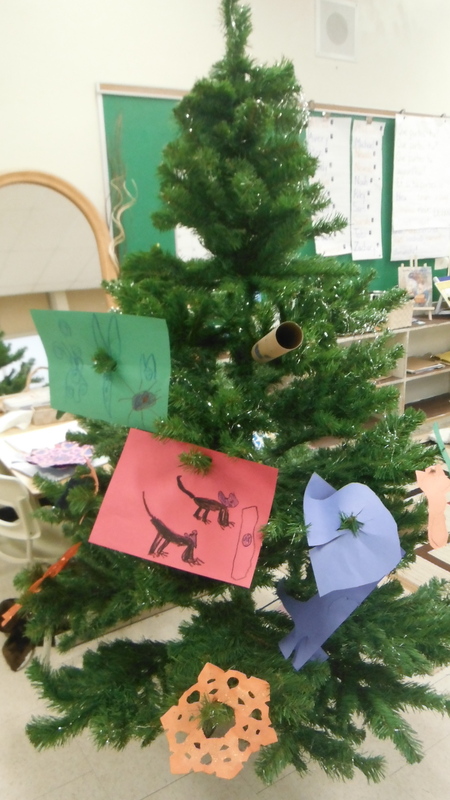 Traditional kindergarten classrooms have been organized around these holidays. They are the stars around which we have orbited. Crafts, activities, field trips, songs… everything has been created in the service of these holidays. We have become enslaved to them. One of the things that has made me worried and uncomfortable about this approach has been the cuteness of it. Cuteness always makes me suspicious. Children don’t do cute. They may be cute but they don’t create things that are cute. Cuteness is a hallmark of an adult inserting her agenda into the process. Adults often view children’s lives as being cute but are they, really? Are we viewing our own childhoods through rose-coloured glasses instead of being realistic about the emotions and events we experienced as children? I am worried about children whose only expressive opportunities at school are geared towards maintaining our adult sense of an idealized childhood. How can they express their own experience if they’re only ever allowed to make a handprint turkey or a ladybug with hearts? How can school be relevant and meaningful if it’s completely divorced from their lives? I don’t know about you but if I had had the opportunity as a child to create Christmas artwork that actually reflected my experiences, my art would have had more to do with intoxicated adults and crushing anxiety than with cute snowmen, but maybe that’s just me. So… I’m left with a dilemma… I don’t want to deny children the opportunity to enjoy holidays – they’re obviously an important part of their lives. But, I also don’t want them to take over and become the focus of everything we do, eclipsing all other subjects and interests. Somewhere between Ebeneezer Scrooge and Martha Stewart is what I’m going for. I use ‘holiday stuff’ as open-ended materials. 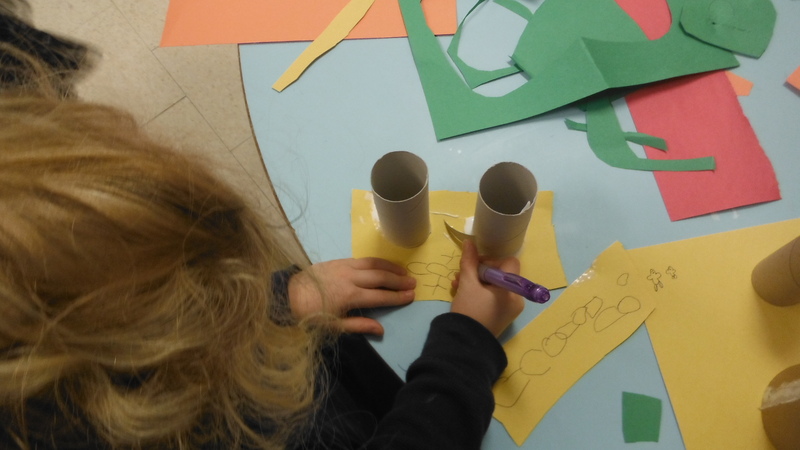 Instead of prescribing crafts for the children to do’, I allow them to use the materials however they want. 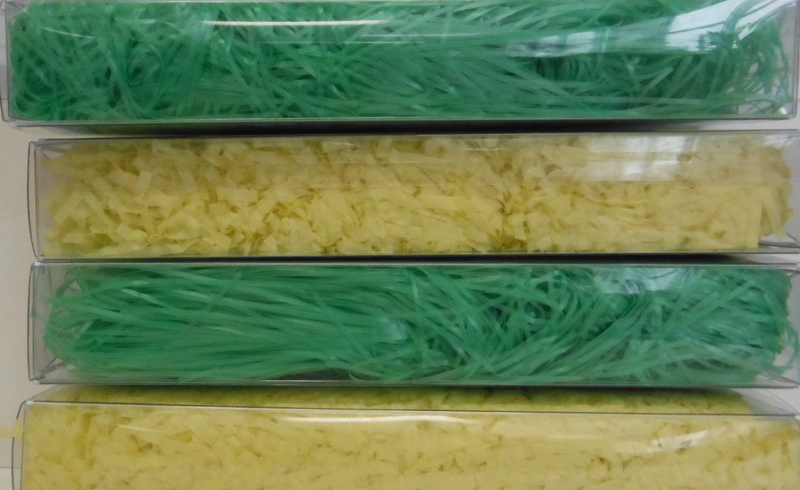 Eggs and Easter grass… what can you make? 2. I honour their experiences, and mine. Yes, we had a tree and yes, we made ornaments but they were their ornaments, not mine. I also invited in one of our parents to talk about the Christmas story and I stashed a menorah in the corner. Holidays are multisensory: the food, the music, the emotions, the smells – it’s not just about the visuals. 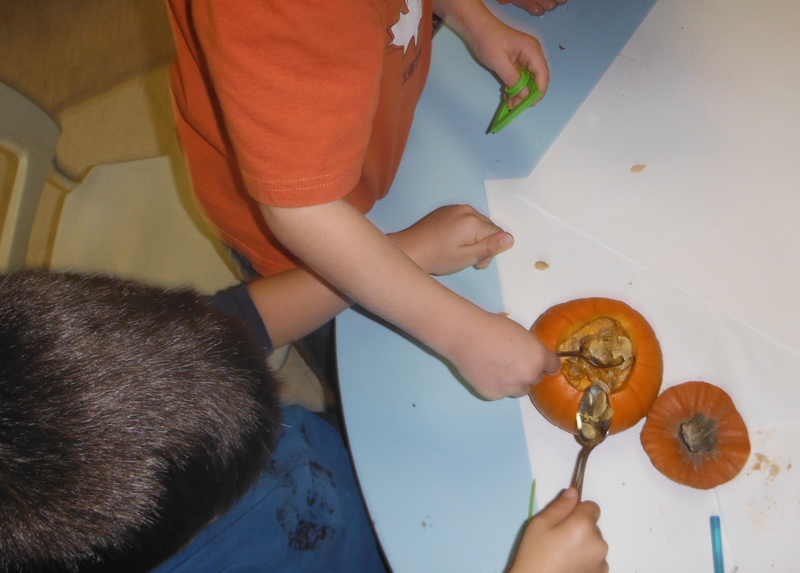 Our classroom experiences should be equally multisensory. Let’s eat together, sing together and build together because memories are always more powerful when they involve more than one sense. I learned fractions by dividing long pieces of licorice into halves, quarters, etc… I remember that. I’ve blocked out the handprint turkey. These have been interesting times in Ontario’s schools. I have a blog post stashed away, never to be seen in public, detailing my rant on that particular subject but, cathartic as writing it was, I think it’s best that it remain in the dustbin of history. One of the side-effects of these interesting times (along with interesting weather) has been that we’ve had a few days with very few children at school. I confess that I love days like this. It’s not because I don’t like having all of my small friends with me but there’s something quite wonderful about being able to focus on children as individuals, with space around them, room to breathe, and time to spare. These days also bring the gift of not feeling any pressure to be productive; no one expects much of you on a snow day. 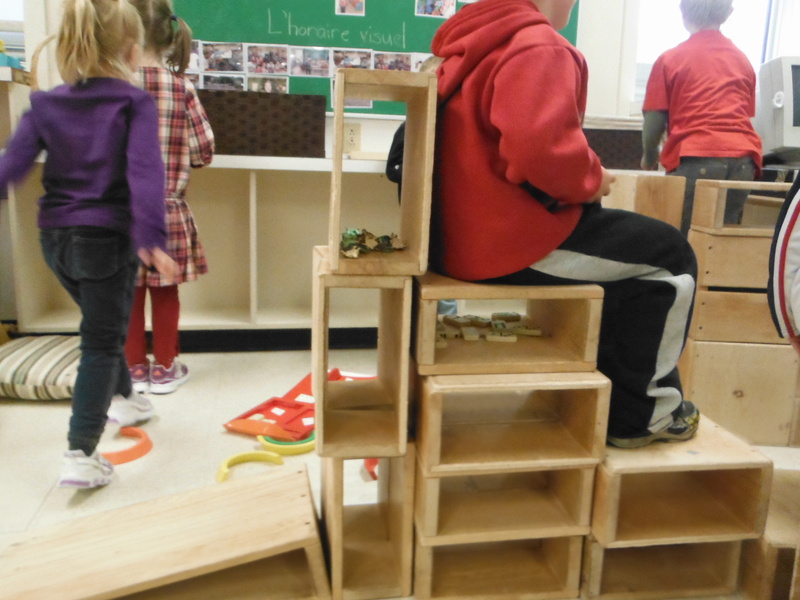 Not having a teacher-directed agenda (not even a Reggio-inspired, creative one) means that the kids are even more in charge of setting the tone than usual. They have their own ideas of how the day should proceed and it’s often surprising to the adults. What we think would be fun is roundly rejected and we find ourselves watching in amazement at what they do choose to do. This photo was taken after our Christmas concert. Most children were picked up right after the concert but four children stayed until the end of the day. They wanted to keep making music and, beginning with the tambourine I had played during the concert, they created their own four-man-band. They marched and, fascinatingly, they counted. “1-2-3-4 buah, buah… 1-2-3-4 buah, buah”. How did they know to count? What did the counts mean to them? One of the band members had been very reluctant to count for me before and suddenly I had evidence of counting marching right in front of me! Glitter IS the season. 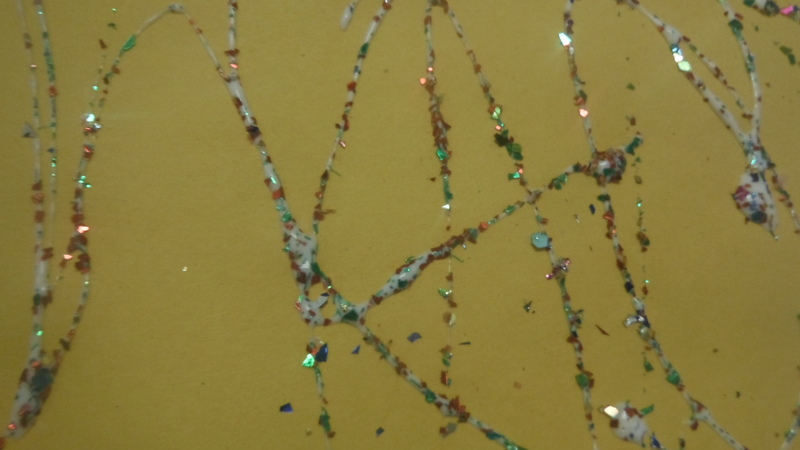 Much to the delight of the children, I finally cracked open the glitter. It turns out that you can spend an entire snow day gluing and glittering and generally being quite thrilled. LEGO may very well be the world’s greatest toy. Snow day, strike day, pajama day, any day… it’s endlessly fun. Suddenly they’re making arrays! Without any prompting from me O decided to make this array showing the number 9. 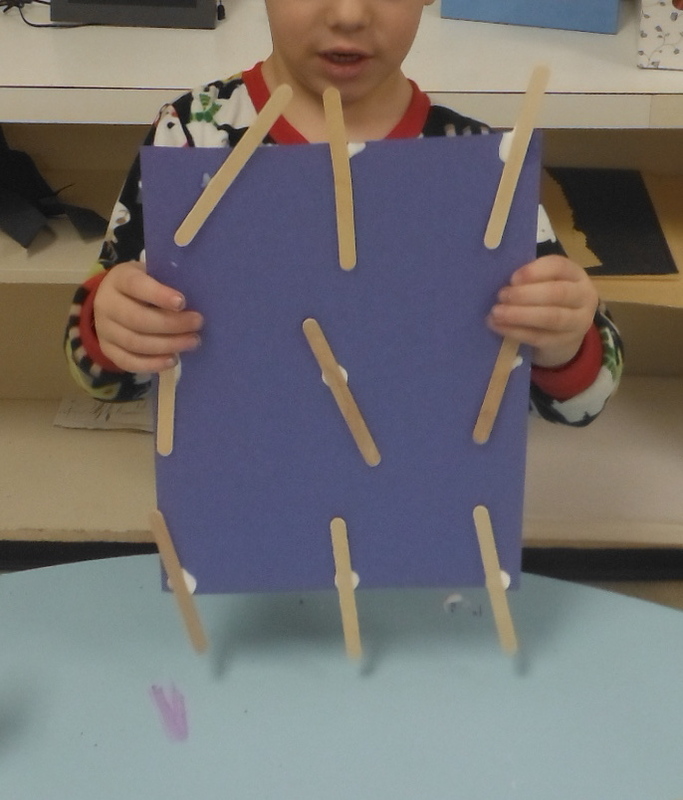 He talked to me about how there were three groups of 3 and how he had organized the popsicle sticks. Amazing! Would I have noticed what he was doing with 15 more children in the room? Madame, I know all you grown ups think it would be fun to watch a movie in the gym but frankly, I just want to read my book! We’ve had an ongoing challenge with toy food. There isn’t enough of it to go around, it’s often expensive to purchase and it quickly becomes the subject of fights. 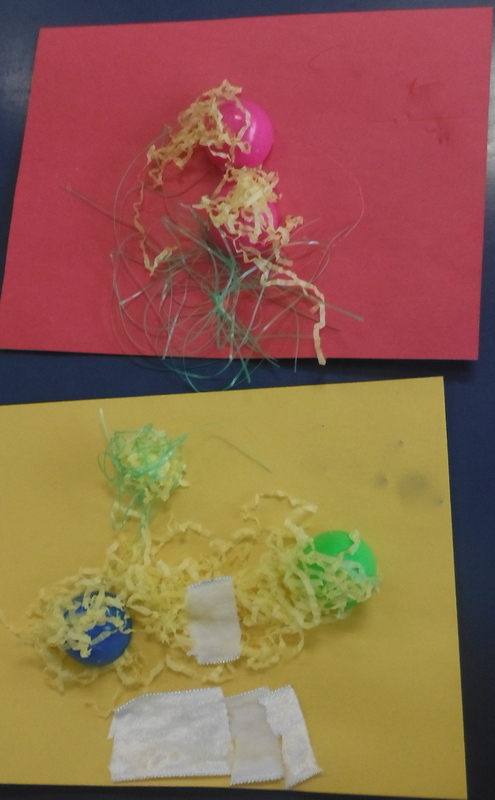 Suddenly, with only 6 children in the class, we hit upon a solution (which seems obvious in hindsight): make it out of plasticine! Alex, I’ll take “Things You Didn’t Know About Mme Emily” for $100 please. In 1984, Mme Emily strapped on the first of many pairs of these pink slippers. Answer, for the daily double… ballet slippers! Yes folks, from then on I was hooked… and I still am. Now, I’m not nearly as bendy as I was at the height of my dancing days but I still value flexibility both physically and intellectually. 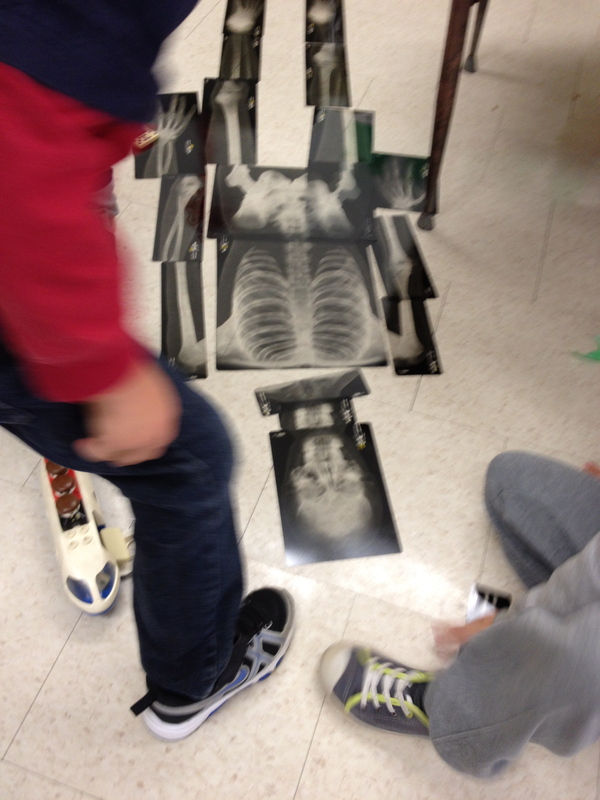 What’s been surprising me lately is the way that students use materials flexibly. I’ve been astounded by the number of times I’ve discovered the children playing with something in one area of the classroom that I thought would never wander from its home. It’s fascinating. 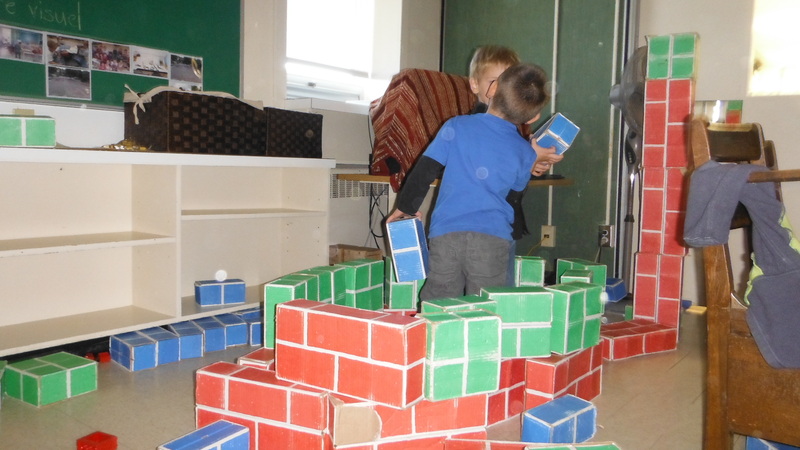 Children collaborate and work independently as they put materials to all kinds of new and interesting uses. This is the bin we use for our inside shoes. Now it’s a house. You can’t see it in the picture but she also has a clipboard propped up against the wall and she was very busy writing with it. 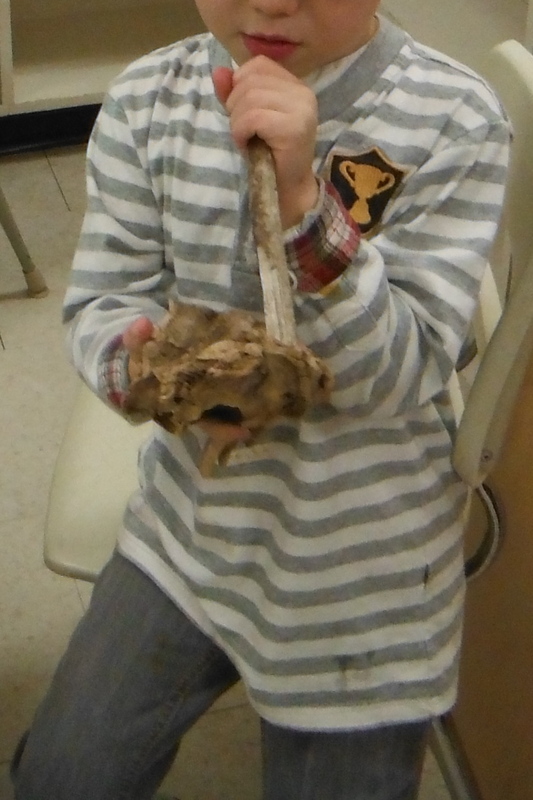 This is a piece of driftwood I collected as a child and a stick that the children brought in from outside. It’s now a musical instrument. 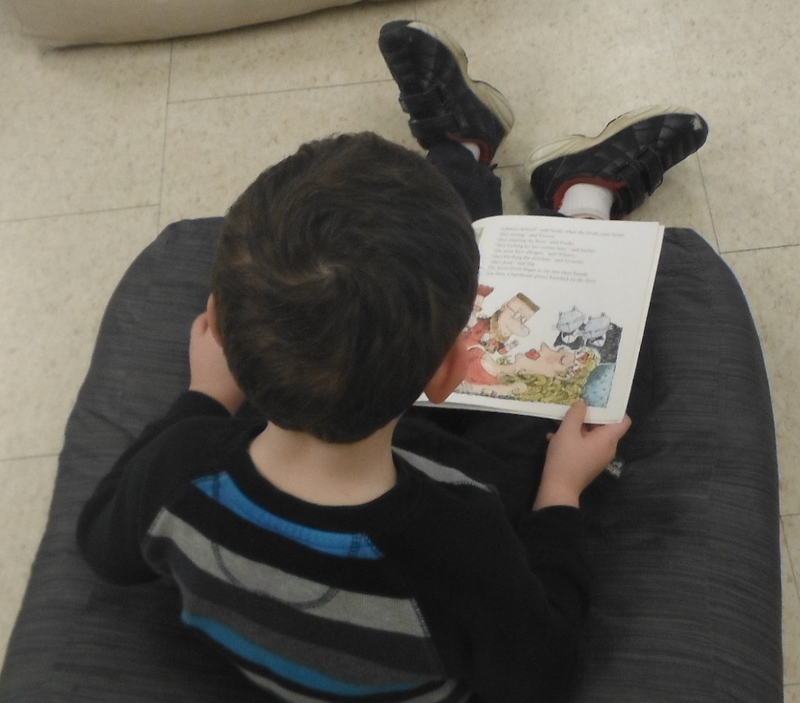 Reading in the block centre… we took the shelves out so that we could fit in more blocks. 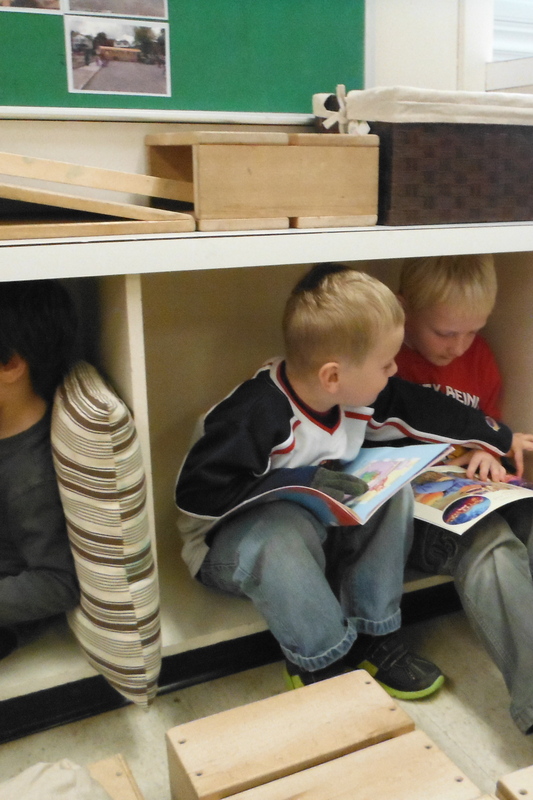 It turns out they make perfect reading corners. Very cozy and great for sharing! Turtles and dominoes no longer in the mathematics area, now being used as inventory and currency in a store… which is also a throne, I think. It’s been a busy few weeks in my life, as you may have gathered by my complete absence. Three days of praying, one while fasting… it takes a few beats for me to wrap my head around teaching again. What’s been catching my eye? The diversity of play. 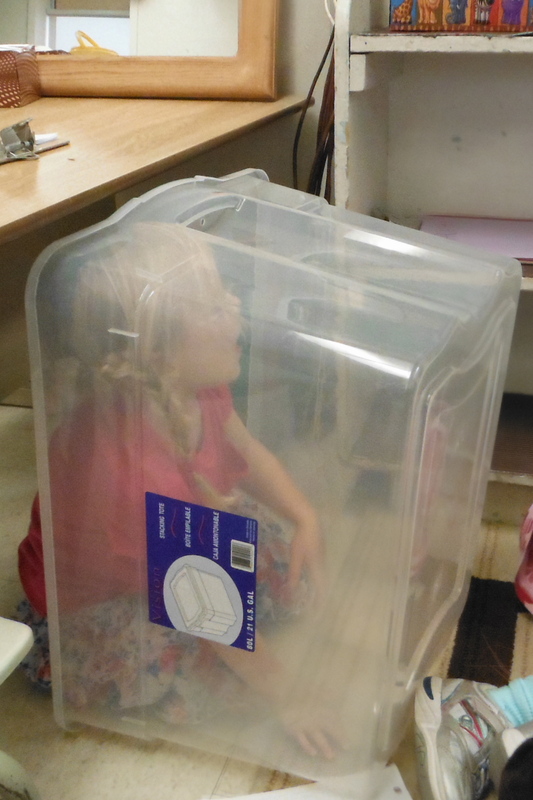 I’m constantly impressed by how the children use the room… they’re everywhere. They find the most interesting corners to climb into. 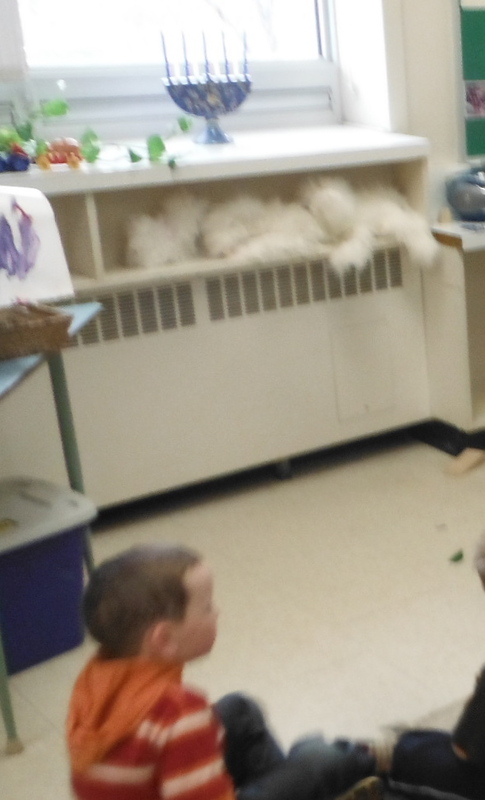 They’re under my desk, in the art studio, surrounded by blocks, lying on the floor, tucked in behind the puppet theatre. They are everywhere and anywhere. My challenge is to follow them. As I’ve explored documenting their play and experimentation over the past few weeks, I’ve been struck by how challenging it is to document some kinds of play and inquiry. 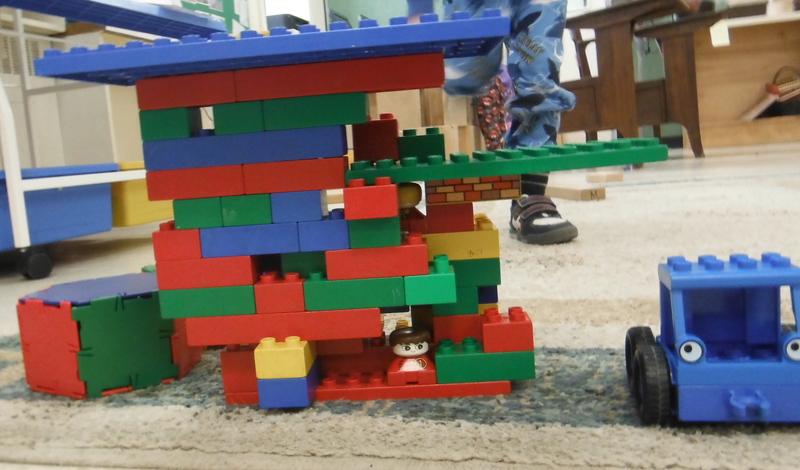 When children are sitting and playing or while they’re making art at a table or easel, it’s pretty easy to chat with them about what they’re doing, to take pictures and video, or to transcribe their conversations with each other. I can eavesdrop without imposing or interrupting. 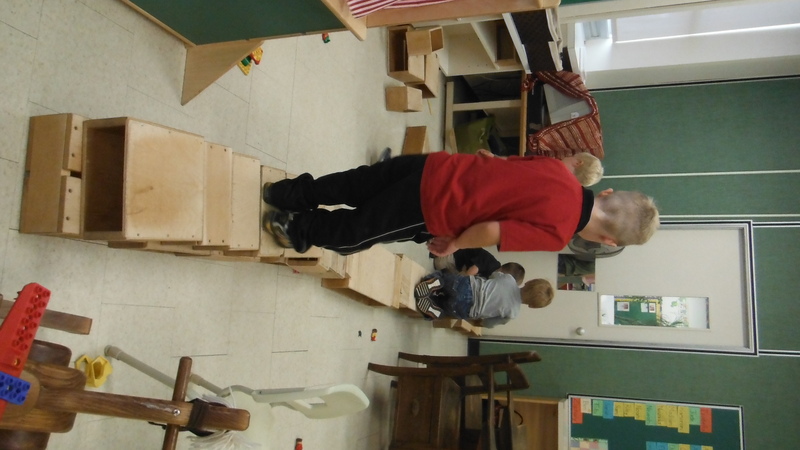 Much harder, however, is documenting play that moves around the room, that runs, that rolls, and that crawls. I’ve been wondering about this, particularly as it relates to boys. While I hesitate to generalize, boys’ play tends to be very active. There isn’t a lot of sitting still. It’s a real challenge to document that kind of play. If you were to sneak a peak into my classroom when I’m documenting you might get to see me walking or crawling while simultaneously trying to take notes, photos, and video; I wouldn’t call it graceful. How easy would it be to miss it altogether, to assume that there really isn’t anything of value happening, to be sidetracked by the teacherly need to keep everything orderly? 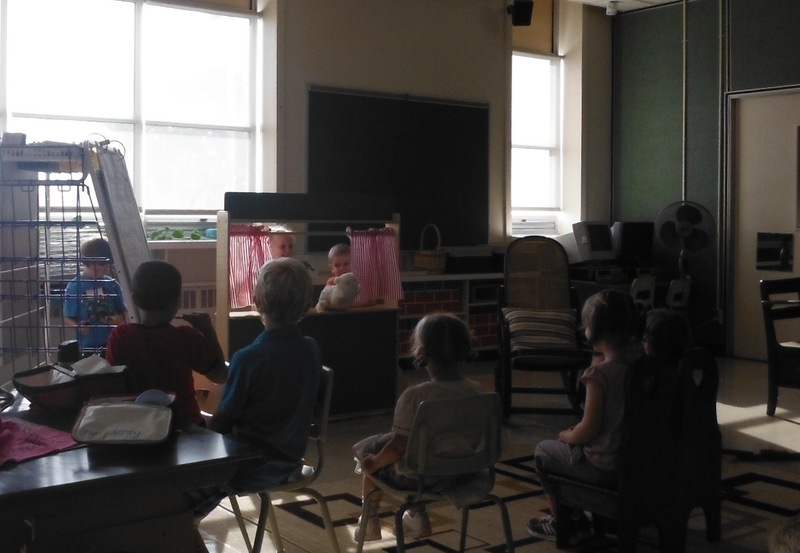 I’ve been making a conscious effort to insinuate myself into this very active dramatic play – in the last week I’ve observed monsters, wolves, spaceships, pirates, and a ticket booth. It’s an ongoing project and, as we take our first steps into outside inquiry and exploration this week, I’ll continue to struggle to figure out how to capture their active inquiry and to do their learning justice. There’s just so much going on… it’s an embarrassment of riches. I really felt that this week. I felt like a detective, a sleuth, trying to sneak up on the kids so that I could eavesdrop on their play without disturbing them. It was exciting and challenging. I often find the minutiae of school difficult to handle: the paperwork, the twice-a-day attendance, the fundraising campaigns, the pizza orders (the humanity! )… it gets me down. It seems like there’s so little time to think, to reflect, to do the real business of investigating with kids and, you know, teaching. But this week felt different. I felt more alive to the possibilities, more awake to the magic that was happening in their play and more in charge of how much of the marginalia I allowed to enter our little universe. There were moments when it felt – dare I say it – sacred. 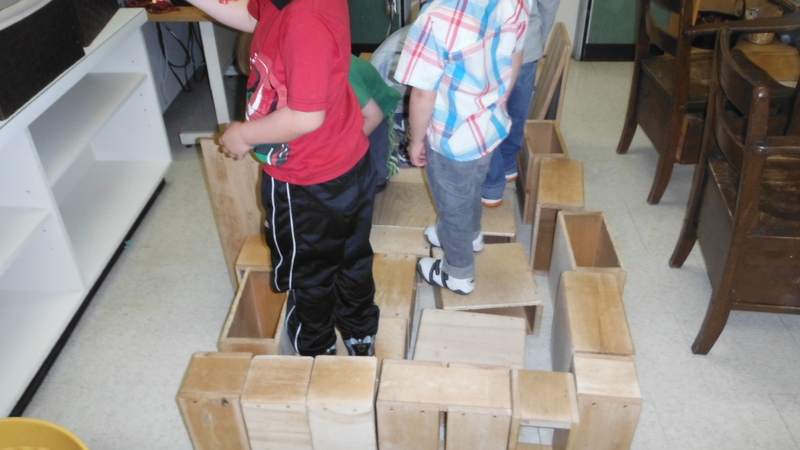 There was a lot of dramatic play going on. They made costumes, they built homes for the puppets, they built cars and thrones and towers, and airports. Definitely something to pursue. What can I add to this area to keep it interesting? 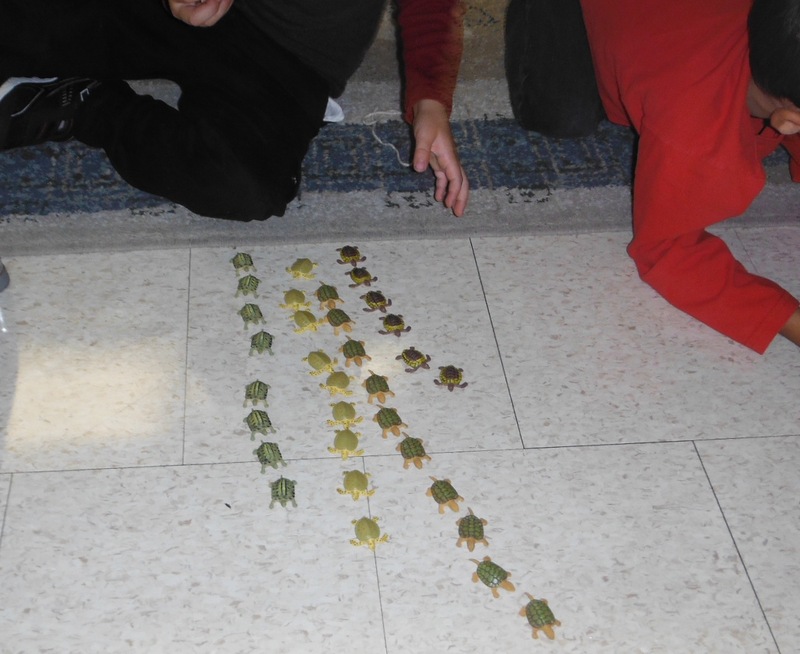 I have two sets of tiny turtles and these were a big hit all week. There was even some fighting over them on Friday. 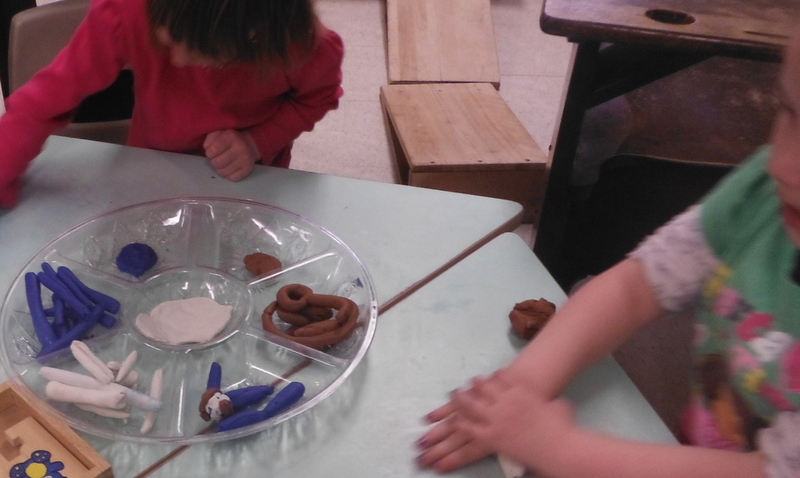 Some children used them for dramatic play, others sorted and counted, some used them in the sand table. I think I’ll grab some books on turtles this week and see where that leads us. I had hoped that birds might be an area of interest. I had a book about birds in the art studio and an art print of an Inuit artist’s painting of owls. 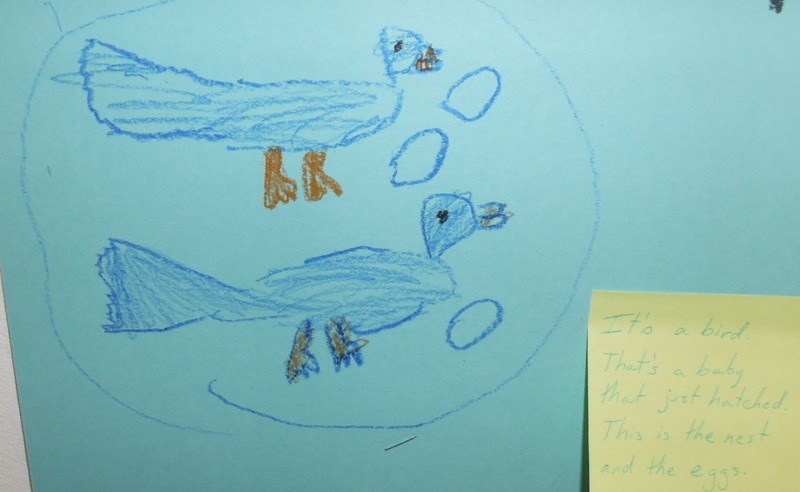 This was the first indication that at least one student was thinking about birds. We talked about it a bit in our morning meeting on Friday and hopefully I’ll be able to get a bird feeder up on one of our windows early next week. The children were also very interested in rocks and got very involved in sorting them later in the week. At one point they were using them as currency in their game. éventail (fan) – it was hot!